Recently I had a WordPress site that I migrated from Rackspace hosting to WP Engine hosting. When it was time to launch the site on the new WordPress hosting service I ran into a bit of trouble figuring out the right DNS settings for their DNS file which was located at Godaddy. With WP Engine hosting service you need to setup your zone file with your domain registrar. This is more unique than not since with most web hosting you use Nameservers to point the domain to the server. WP Engines does not host DNS. Therefore you need to do some configuring with the DNS file where your domain is register. In this case Godaddy was the domain registrar so these DNS file settings are specific to a Godaddy DNS file though they may work for other registrars. The name servers should be set to the domain registrar, not the website host. In this instance they were initially pointed at Rackspace so I simple set them to the default Godaddy name server. An A record points a domain to s specific IP. Even though WP engine recommends using CNAME records if possible, with Godaddy they recommend using an A record. Set your A record to point to your WP Engine IP. Your IP Address is located in your WP Engine control panel. Click on your install and your IP will be listed to the right of your domain and temporary domain. The CNAME record is simple yet necessary for the DNS to point appropriately. A CNAME is a way to point a record to another name. For this setup we set the host as WWW and the point to @. Since WP Engine doesn’t host email we need to use another service, such as Google Apps. 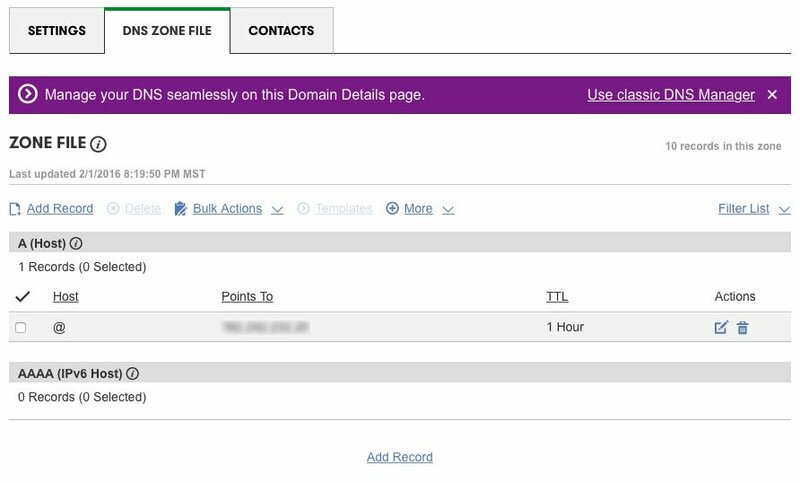 In your DNS file the MX Records control where the email is being directed to. In this case we were using Google Apps. You will want to fill in the appropriate MX records if you are not using Google Apps. Overall this is a real simple setup and I hope it helps bring some clarity to a task that is not common to do unless you are setting up a site on WP Engine hosting. I would add that, in my opinion, WP Engine has some of the best hoisting service available for WordPress and this extra step is well worth all of the benefits your site will get from their hosting service. Thanks for this Sherpa. It worked for our wordpress / godaddy / WP Engine hosting combination. The documentation on WP Engine isn’t terribly clear on this at least from what I could find.